Provost Forrest Maltzman defended the quality of the University's online learning programs in a presentation to the Faculty Senate Friday. 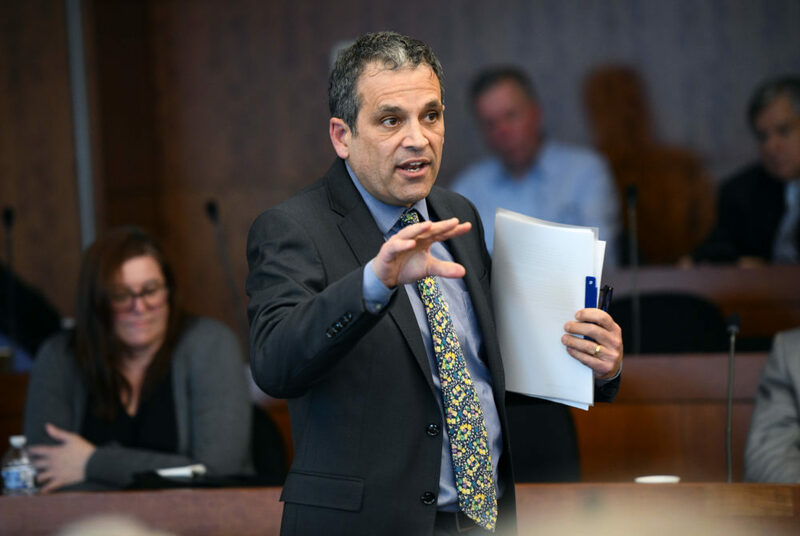 After a report raised questions about unequal standards and oversight of courses taught online, Provost Forrest Maltzman defended the quality of the University’s online learning programs in a presentation to the Faculty Senate Friday. Maltzman insisted the University’s online offerings are equally as strong as traditional classes, citing data showing that programs have high student satisfaction and often outperform peers in national rankings. But he also recommended departments and programs act to increase monitoring of those courses using surveys and retaining lectures. “There is no reasonable examination of this that anyone can walk away and say our online programs are worse than our other programs,” Maltzman told the Faculty Senate. In October, a faculty task force found that online programs had spotty and varied standards across schools and that quality could suffer because of the large number of adjunct and part-time faculty teaching those courses. Maltzman released a memo last week in response to the October report, contesting many of its key findings but also laying out four main steps to improve monitoring and evaluation. The memo states that the provost’s office will send a reminder to academic leaders that schools are responsible for the academic integrity of all their programs, clarify that schools need reviews for online programs as well as traditional programs, must retain online lecture materials for at least one semester to allow programs to review their offerings and must use the SmartEvals student evaluation system, which includes questions specific to online courses. Maltzman’s response states that faculty and students involved in online programs felt “unfairly denigrated” by the initial report and the news stories from several outlets that followed its release. He said the actions his report implements will help faculty maintain online quality as the programs continue to grow. “Several of the students who wrote to us said this is really important, this is the way I’m getting my degree,” he said. Seven of GW’s online programs were nationally ranked in 2018, according to the report. The report also included results of online student evaluation forms over the past two years, which found that students taking online courses have an equal or greater satisfaction than those in traditional classrooms. Maltzman refuted the report’s claim that there is no “master list” of online programs – pointing to a section on the schedule of classes. Kurt Darr, the head of the task force that released the initial report, declined to comment for this story. Philip Wirtz, the chair of the Faculty Senate’s educational policy committee and a professor of decision sciences and psychology, said Maltzman’s response highlighted the strengths of the University’s online offerings – which were missed in the original report. But he said it’s important not to “throw the baby out with the bathwater,” saying that while the initial report was flawed, it did raise crucial questions about a lack of standards across schools. Wirtz said he will be introducing a resolution in the Faculty Senate next month calling for more uniform standards in managing online and distance courses. He said there may not be a problem with the programs now, but more uniform standards could prevent problems down the road as online classes expand. “There are unique problems associated with online programs, and standards are very much appropriate here,” he said at the meeting. Maltzman cautioned faculty against asking the University to implement sweeping standards, saying – just as with traditional programs – individual departments should have broad latitude to oversee their academic offerings. Charles Garris, a professor of mechanical and aerospace engineering and the former chair of the Faculty Senate’s executive committee, said the provost’s response doesn’t address any of the concerns that were brought up in the original report. He continues to worry about the faculty who are teaching these programs because the report didn’t provide any solutions to the original problem, he said. Garris said the University should make a better attempt to coordinate online programs with each other and standardize the guiding rules for developing them. In 2016, the University debuted a course to help faculty develop their online classes. Henry Nau, a professor of international affairs and a member of the Faculty Senate, said Maltzman’s response doesn’t clear up key questions about GW’s overall online strategy. Based on the research the provost presented, he said online programs are an effective way to increase revenue at GW, which depends on tuition revenue to fund much of its budget. Online education now accounts for about 10 percent of GW’s total revenue stream. Nau said more students can be taught with fewer resources online and the courses appeal to non-traditional students. But he said the University should be more clear about how they plan to grow the program and increase revenue. “I have questions about what the relationship between a brick-and-mortar university and an online university, competing against schools that are strictly online and other brick-and-mortar institutions,” he said.